Ocean/Gulf Resort, 1st fl. Recently remodeled! Hurricane Season 2004 was a very destructive time for Ocean Village. As a result, a lot of the condos had to be completely refurbished to get them back to their previous splendor. Our condo was one of those. Everything from walls, floors, cabinets, appliances and furniture was replaced. The ending product is far more superior than ever before. Our condo is a convenient 1st floor, corner unit apartment, five-minute walk to the beach, main pool and 1st green. Your car is parked right outside our front door just a few feet away. As you go through the front door, you are immediately in the kitchen area. The new brightly painted walls with the white cabinets give you a feeling of cleanliness. The kitchen is immaculate and fully equipped for any gourmet meal you would like to create or just to mix a couple of martinis to relax outside by the back sliders. There is a coffee maker, toaster, toaster oven, mixer, and even a blender for those favorite mix drinks. Because of the openness of the kitchen and living room area, you can be in the kitchen and still enjoy your guests sitting on the queen size sofa bed in the living room. There is a great entertaining center with a 32” Flat Screen color TV/DVD/VCR to enjoy a quite evening watching your favorite movie. There is a round wood table with four chairs where you can get together with guests to enjoy that gourmet meal or just play a nice board game with your family. The French doors to the bedroom, gives you the option of having it all open, or close for privacy. Here you we have a king size bedroom set with a pillow top mattress to ensure you will get a good night sleep. There is also a 27” color TV/DVD for a more intimate and cozy movie watching. Here as well as in the living room area we have ceiling fans to make your stay more comfortable. Through the hall is the 2nd sink/vanity which is great for the lady who wants to take her time getting ready. Here is where our linen closets are, complete with plenty of towels, sheets, beach towels and even beach chairs for a day at the beach. On the other side of the wall is our bathroom also almost new with all the refurbishing. We have a washer/dryer, and with the iron, ironing board, you won’t have to worry about packing a lot. 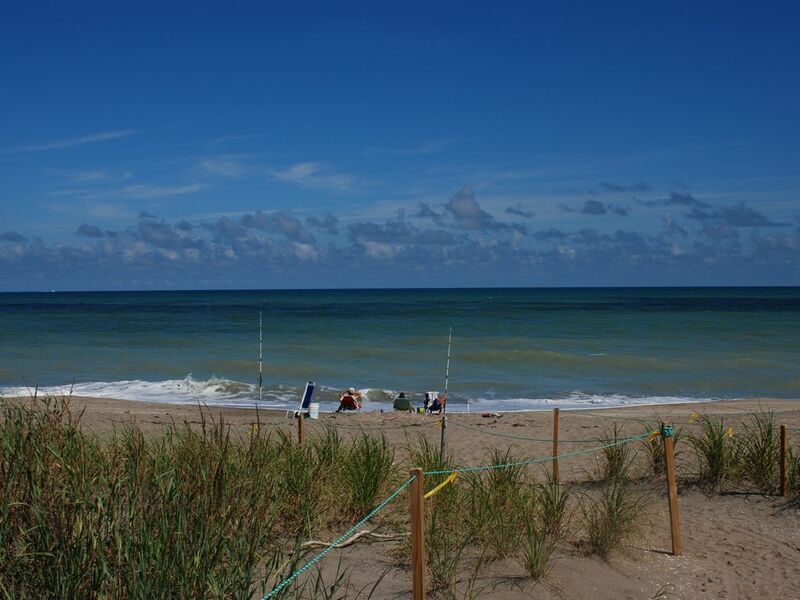 Just leave plenty of room to bring back all the treasures you will find here on our Treasure Coast Paradise! Ocean Village Resort is located on S. Hutchinson Island in Fort Pierce. There are 10 tennis courts, 9 hole par-3 golf course, 3 pools (heated), a tiki bar, hot tub, exercise room with sauna and showers, squash courts and more. There is a fabulous restaurant on the premises. Enjoy the private beach and soak up the sun. The resort is surrounded by beautiful landscaped grounds. We provide beach chairs; you can bring your own clubs or rent them through the office. The apartment is completely furnished with plenty of linens and towels provided. The kitchen is fully equipped with dishes,pots & pans, microwave,dishwasher, refrigerator,toaster,toaster oven and coffee maker. Convenience is what makes our condo so great! Your car is parked just a few feet outside the front door. The beach and the main pool a short walk away, just on the other side of the 1st green. The condo was wonderful! It had everything we needed, conveniently located near the main pool and the Inn, loved the view of the pond with fountain. It was fun to see the shorebirds and turtles by the pond. I highly recommend this place! Good location, clean. Gap in sliding door let cold air in. Relaxing vacation, beautiful beach, excellent resort. What more could you ask for. Pet friendly vacation a short walk from beach, restaurant, pool, and Tiki snack bar. We will return. Talked with many residents who mostly said they had visited and then bought because it was so nice. We stayed at this condo for a week in May 2009 and just loved it. The location is one of the best in Ocean Village due to the proximity to the main pool (the one with the Tiki bar) and the beach. The property was very clean and generously supplied. The owner provided the highest customer service, returning the deposit promptly and even mailing us the bathrobe that we left behind - and we didn't even ask him to! Thank you for a great vacation ! Very clean and comfortable. We could set outside of the sliding door and look at the little creek with bridge. Very nice people in condos. Everyone says "Hi!" and is very helpful. There is so much to do here. Play golf, tennis, swim, fitness center, boce ball and then of course the ocean! We traveled with kids and felt very welcomed. We were visiting friends that lived in Port St. Lucie . We would stay again. Golf: If Ocean Village's 9-hole golf course is not enough for you there are 17 championship golf facilities consisting of 21 separate courses (mostly Fazio and Nicklaus designed) all within a 40 minute drive. Prices range from $15 to $35 for 18 holes with a cart during the off-season. In-season prices are about double. All of these courses are open to the public. One Week Minimum 'Off' season is May 1 to Nov. 30 Rates are: $650/week, $93/night $2600/month; $300 refundable security deposit and one-time cleaning fee of $100 Plus: Florida Resort Tax 11.5% 'Peak' season is Dec. 1 to Apr. 30 Rates are: $900/week, $107/night $3000/month; $300 refundable security deposit and one-time cleaning fee of $85 Plus: Florida Resort Tax 11.5% *Rental Deposit of $500.00 needed to reserve condo, 2 equal payment, option is available for monthly rentals.